Inside: Once you try these extra crispy onion rings, you will never need to search for another recipe. They are perfect appetizers for any occasion! Para Español, Haz Click Aqui! Onion rings are a very popular snack food here in the United States that you can find in pretty much any fast food restaurant. While they are pretty easy to make, it can be hard to get them to be perfectly crispy when making them at home. 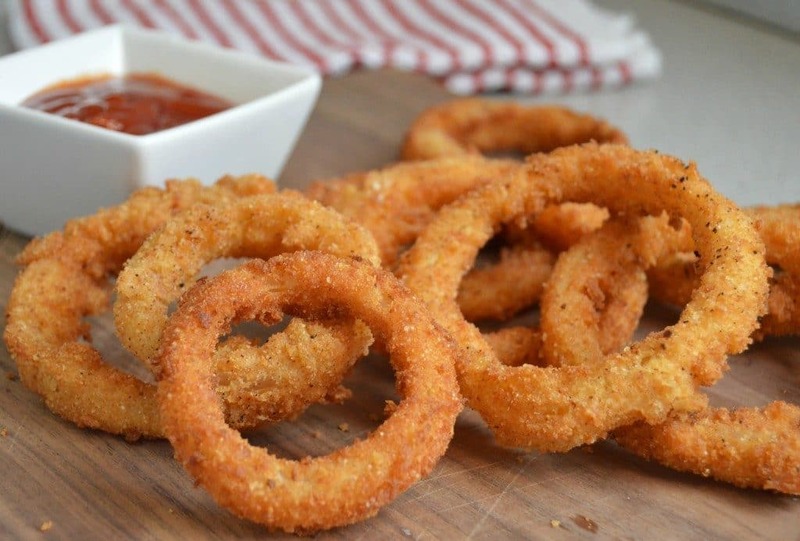 This recipe will ensure that your onion rings come out perfectly crispy every time. You may be wondering what kind of onion is best when making onion rings. This recipe is so good, that you can really use pretty much any variety. That said, I almost always use either a standard yellow onion, or a white onion. For some reason, both of these seem to result in a more crispy, tasty onion rings than other varieties. STEP 1: We start by cutting the onions into rings about ¼ of an inch thick, separating them from each other very carefully. This recipe works best with the big and medium sized rings. 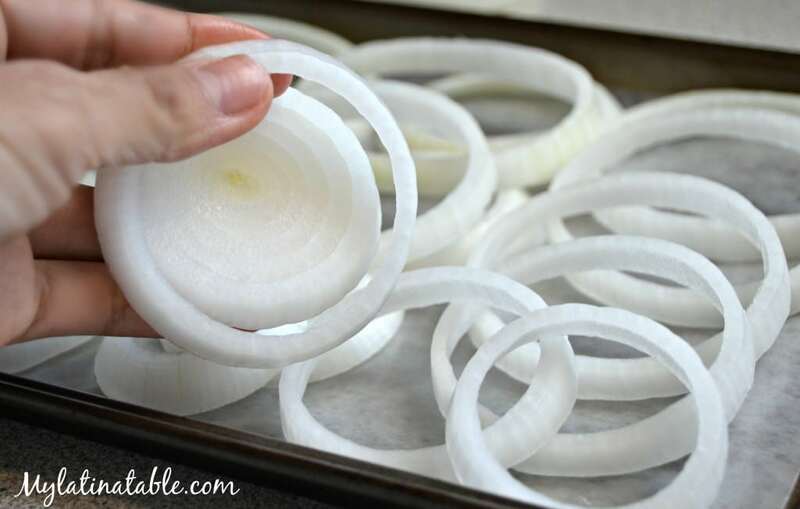 Expert Tip: Instead of wasting the small rings, save them in a bag for other recipes that use onions. STEP 2: The next step is to prepare the breading by combining the flour, the baking powder, the salt and the paprika. You can replace the paprika with chili powder, or omit it completely if you don’t have it on hand. Mix well and coat each onion ring with the mix before shaking to remove excess flour. STEP 3: Next, in another bowl, we combine the milk, the pepper, and the egg and beat until well combined. Add the remaining flour mixture and stir until no lumps remain. 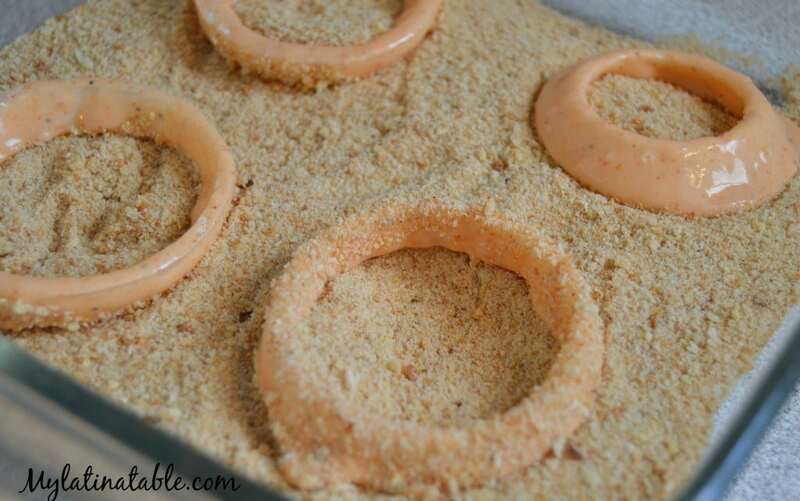 Coat each onion ring in this mixture as well and then coat in breadcrumbs. STEP 4: The final step is to fry in a fryer or in a pot with enough oil to cover the onion rings. I recommend adding about 3-4 onion rings at a time so that it is less likely that they burn. Once ready, pat dry with some paper towels to get rid of the excess oil. Although onion rings are not very common in Mexico, they definitely go well with some Mexican classics like Carne Asada, Chicken Tortilla Soup, and Tacos Al Pastor. I love combining recipes from different cultures into a single, diverse meal that everyone can enjoy. Now, I know this recipe is fairly simple, but if you have any questions about how to make it, or any comments on how you would make them better, please come back and leave a comment below. Fryer: While you can definitely make these in a pot with oil, it is easier to do in a fryer. I recommend this one because it has a large capacity and two baskets, but there are many others to choose from as well. 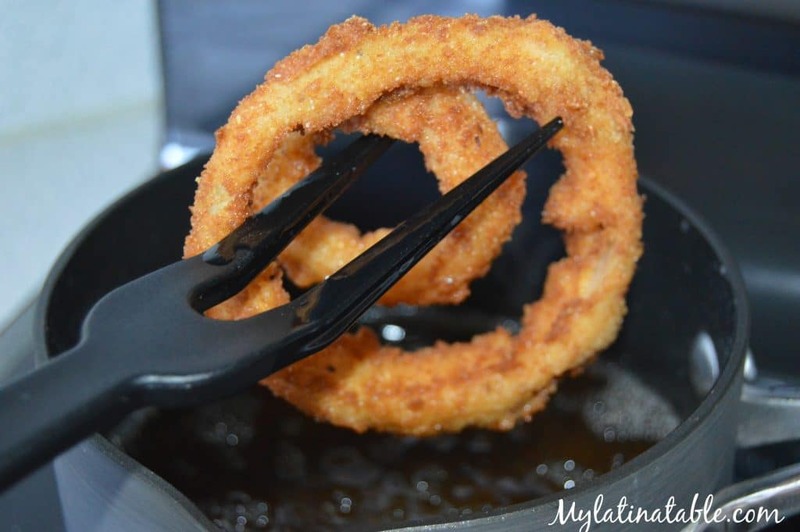 Measuring Spoons/Cups: You are going to need to measure all of the different ingredients that you use to make these crispy onion rings. I don’t know about you, but my measuring cups always seem to get separated and sometimes I can’t find the one I need. I recommend this set, because it has the spoons and cups all together, is stainless steel, and has a solid ring to keep them together. Kitchen Prep Bowls: Since you have to use multiple bowls in this recipe for the batter, the flour mixture and the bread crumbs, it is important to have some good kitchen prep bowls. I like these ones because they can be used to prep and they are good for serving as well. Knife Set: When you make onion rings, you want to make sure that you make nice, clean cuts on the onions so that you get the perfect ring. If you don’t have a sharp, high quality knife set yet, I recommend this one. It will last you for years and will result in perfect onion rings. 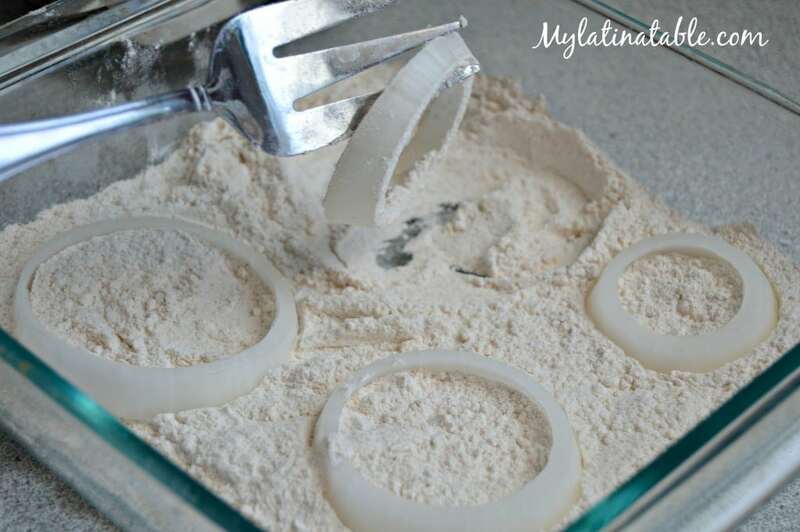 Condiment Bowls: These onion rings go great with many sauces, including our homemade ranch. You will want to have some of these condiment bowls on hand so that you can try it with as many different sauces as you want. 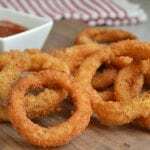 Homemade Extra Crispy Onion Rings are one of my favorite appetizers to make - especially for game time parties and more. Combine the flour, baking powder, salt and paprika in a medium bowl. Fry the onion rings in a fryer or a pot with oil. I have made these several times now. So simple and delicious. I use buttermilk and sweet onions. Thank you for sharing! Thanks for the feedback Laura! I usually use sweet white onions or yellow onions and they seem to work well. I’m not sure what the issue was with the flour sticking, but I suspect you could be right about the onion being too dry. Thanks for the feedback about the Panko as well – I had never tried it with Panko, so I thought it might work, but it sounds like it doesn’t – so that is good to know. Thanks again! Spanish Onions are the best onion for rings. Bold in flavor and large in size. A trick to try is removing the skin from the inside of each ring. A five minute soak in a ice bath will aid in its release. The result is a ring that doesn’t release from its batter. a lott more, Please do keep up the awesome job. I made them and they were so good. Thanks for sharing. Was excelents my family loved it, this Will be my favorites over all. Only I change The salt for suggar. Your page http://www.mylatinatable.com/homemade-extra-crispy-onion-rings/ does not load correctly. Not able to read any of the comments. I hope I am correct to assume T = Tablespoon and t = teaspoon? I have never seen a a recipe use this distinction (capital v lower case). It took me a while looking at the ingredients to notice the difference. I’m not sure what is going on with the comments, but I will look into it. Yes – T = Tablespoon and t=teaspoon. I used to use that distinction on my recipes, but haven’t updated all of my old ones. I will go in and update this one now to make it more clear. Thanks! Loved this recipe just the crispness I was looking for! Yum!! Baked these instead of frying. 425 for 20 mins. Turned out pretty crispy and delicious. My son gobbled them up! I’m sure they are better fried, as everything is, but turned out ok baking too! Is baking powder essential? That’s the only thing I don’t have on hand but would like to try and make these tonight. These are AMAZING!! I had Panko crumbs which upped the crispiness. So good! Thanks, Carrie! I’m glad that you enjoyed this recipe. So you think leftovers could be frozen and reheated in the oven? Hi Rebekah – I have never tried doing that, but it could possibly work. These are usually better eaten right away, but reheating in the oven is a good idea and may help you get that crispiness back after freezing. Let me know how it turns out if you decide to do that! hi i cant find the measurements or weights for the onion ring ingredients. How long do you fry them? Hi Lisa, you will want to keep a close eye on them and fry them until they are golden brown. Once the oil is hot, I find that it takes about 30 – 60 seconds maximum. Hope that helps!